The Former American Idol Finalist Has Notched an Undeniable List of Pop-Rock Fist-Pumpers. You can't deny these Daughtry essentials. We still don't quite understand how Chris Daughtry didn't win the fifth season of American Idol. Sure, we have great affection for Katherine McPhee, and she's blossomed into quite an excellent entertainer and actress, but Daughtry's voice is a force of nature. From such covers of Bon Jovi's "Wanted Dead or Alive," Elvis Presley's "Suspicious Minds" and Creed's "What If," his consistency in style, presentation and execution was rarely achieved at such a level (Adam Lambert says hi, though) on some dinky primetime singing competition. 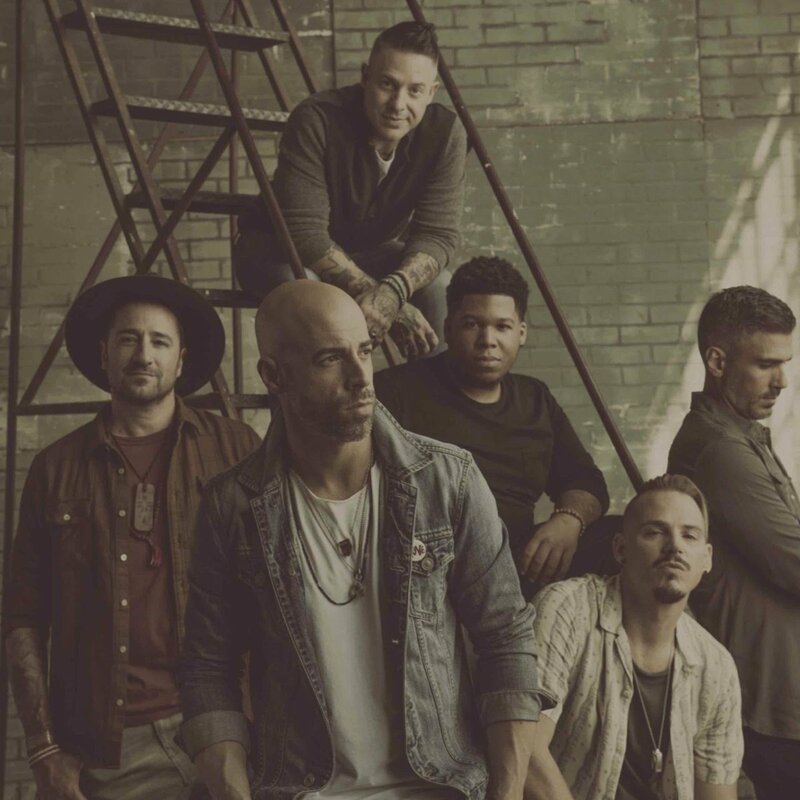 After his disheartening fourth-place finish, outfitted with a band of players (which now include Josh Paul Brian Craddock, Josh Steely and Elvio Fernandes) to form a band called Daughtry, four studio records have been released through the years. The self-titled debut is still a gem, and the follow-ups, Leave this Town (2009), Break the Spell (2011) and Baptized (2013), zig and zagged between their classic arena-rock style and trendy production choices. Somehow, it has been five years since the last proper studio set, although the band did drop a compilation in 2016 titled It's Far from Over...The Hits So Far featuring a couple new songs. Below, we've compiled the 10 Best Anthems from their catalog. Check out our picks and let us know your favorites in the comments. We all need a good and addictive post-breakup anthem. "Over You," the third single from the band's first record, hangs its hat on signature mid-00s, heart-stained poeticism. Daughtry's lead power vocals hit the sweet spot of down-pouring pain and resilience, as he climbs up the notes with fervor and casts the past aside for a brand new day. "Well, I never saw it coming / I should have started running a long, long time ago!" he sings, the ache erupting from his chest. Later, he sets out a plan for a full recovery, "Now I'm picking up the pieces / From spending all of these years / Putting my heart back together." In a turn away from heartbreak, Daughtry bemoans falling for a former lover's tricks. The opening trickle of delicious pop spins and reels back into their rock structure, beating and lurching as the frontman struggles with his own feelings. "It's too late now to put out the fire," he whispers before the arrangement returns in shockwaves down around him. "I thought I was stronger." Guess not, man. The band's last long-player was quite an adventurous ride. Stretching into folk-based pop and rock music, with the use of acoustic guitar in many arrangements, including on this fiery jam. "I'll Fight" feels familiar but fresh. The sky-defying chorus is there, but perhaps the production allows the "ooo"s to pierce through like never before. And Daughtry sounds crisper, his voice far more penetrating than in his previous work. "I wanna see you fly way beyond the sun / Anything you're ever gonna dream, I pray that it will come," he sings. Nostalgia just feels so right. Daughtry paints quite the romantic snapshot of his youth, singing, "Two hearts on a getaway / Feels just like yesterday / Young love on the freeway." The song clips along as you might expect, but from the outset, it feels very much like a reimagining of Journey's "Don't Stop Believing," down to a few inflections on the verses. Thinking about the passing of time is always bittersweet, and Daughtry's voice carries both an idealized perspective of the past and a sobering reality. There's a reason the air-guitar, hair-band, power-pop template of the '80s has stuck around: it's so damn irresistible. Daughtry's career has often been planted somewhere between Journey and Nickelback, and there's absolutely nothing wrong with that. "Life After You" is pretty high on the sweets, but Daughtry's vocal is convincingly raw. "All that I'm after is a life full of laughter / As long as I'm laughing with you," he packs on the charisma over stinging guitars. Containing the album's moniker in one of the song's most important lyrics ("Another day, another battle / We all have a cage to rattle," Daughtry resolves), "Death of Me" is a bit more somber, slow-building with playful tribal percussion. But the pay-off is more than worth it. Musically speaking, "Death of Me" is among the band's most interesting, layered with depth and a wide reach. Its message is deafening. "I can't believe I stayed 'till today," Daughtry belts over Nickelback-needled guitars. The aftermath of a relationship that should have ended a long time ago is both replenishing and jarring. Cutting the ties that bind is never an easy move, but once Daughtry lets go, the storm rolls away. "No Surprise," the lead single to the band's second album, falls right in line with much of their catalog, but there is something so innately inescapable about this lead-off. Don't fix what isn't broken. Daughtry has a formula, for better or for worse. From the roar of percussion to the reliably soaring hook, you've gotta hand it to them: they've perfected their catalog down to the melodies. Here, they liken love to a torch that can never be extinguished. "Love is like a torch that's burning bright / Carry it on, carry it on and you'll see," Daughtry prompts. It's a bit of a timely notion, especially that just two short years later, the world is/was crumbling into ash. Come on. If we're talking about those saccharine and overly emotional anthems, "Home" can't be ignored. After becoming a Top 5 hit on the Hot 100, it would later serve as the apt backdrop for all ousters on Idol, tugging at the heartstrings as countless other Hollywood hopefuls got the boot far too soon. Tears and tissues, oh my! Daughtry's vocal is gentle but evocative enough to drain your tear ducts completely. "Be careful what you wish for," he warns. "You just might get it all..."
Well, now we know what would happen if Daughtry ever went country. Sink or swim? They're darting across the water at a brisk pace. "Long Live Rock & Roll" isn't groundbreaking, but it's a finger-plucked, boot-stomping good time reminiscing about the past and trying to reclaim youth and a music of a time gone by. "Long live crazy nights and records made of gold," Daughtry sings, sprightly traipsing along with the cheers and jubilant coos in the background.